Australian broadcaster SBS has teamed up with RTE Ireland and History Channel UK to produce a new reality series in which participants will recreate life in a New South Wales colony 200 years ago. A British family and an Irish family will be shipped to the far side of the world to join an Australian family and ten convicts in a fledgling community. They will replicate the early days of European settlement in its struggle for survival - a settlement which was founded on native Aboriginal land. Related to the days of early settlement by either blood, place or occupation, our participants must eat the same food, wear the same clothes, sleep in the same shelters, use the same tools and live by the same harsh rules as their ancestors. The convict participants will include up to ten Australians, descended from convict stock, who will work as indentured labourers for the free settlers. Filming will take place between August and December this year during which time participants will not be allowed to contact their families and friends back home. No prize is offered. The producers say the only reward is "a once-in-a-life time experience to re-live the life of Australia's European settlers and Aboriginal inhabitants". MONDAY 29 MARCH 2004 ­ Hilton Cordell and SBS Television have announced a nationwide call for participants for THE COLONY ­ the remarkable new living history series which will transport free settler families, indigenous Australians and convicts back to early colonial Australia at the beginning of the nineteenth century. A study in living history, The Colony is the first experiential history program to be made about Australia and aims to explode myths and illuminate the historical truth of life in Australia’s early colonial days. Rigorously researched and developed over three years, THE COLONY will ensure the historical accuracy of the period 1795 to 1815 ­ in which, over four months, modern day families and individuals will experience the period of early European settlement with its laborious and hierarchical toughness and incredible challenges. The participants in the series will mirror in miniature the social structure of the first European settlements - the British free colonists, the Irish political refugees, the children of existing settlers, Aboriginal clans and the members of the military aristocracy. In order to re-create dialect and social authenticity the producers are looking for one Irish and one British family, one Australian family, indigenous Australians, plus individuals willing to live the life of convicts. 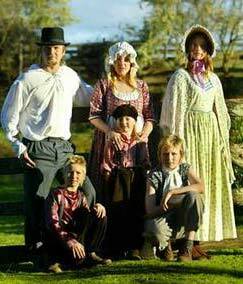 This diverse group of people will travel back to the early nineteenth century and live in early settlement conditions in this landmark series, which goes to air on SBS Television Australia Day, 26th January, 2005. Created by one of Australia’s most respected producers of quality factual programming, Chris Hilton (Dying to Leave, The Irish Empire and Shadow Play), the series has undergone a three year development period of intense research into the political, economic, religious, and social climate of the colony of New South Wales circa 1800.